Check out Mary Free’s video of Hummingbirds feasting on Lonicera flowers. Low maintenance and showy, Trumpet Honeysuckle blooms intermittently until frost with coral flowers and red fruit present together. A more compact cultivar, ‘John Clayton,’ produces fragrant yellow flowers and copious orange-red fruit. It was discovered in 1991 on the grounds of a 17th century Virginia church. The species name “sempervirens” refers to the plant’s evergreen habit, particularly in the South. 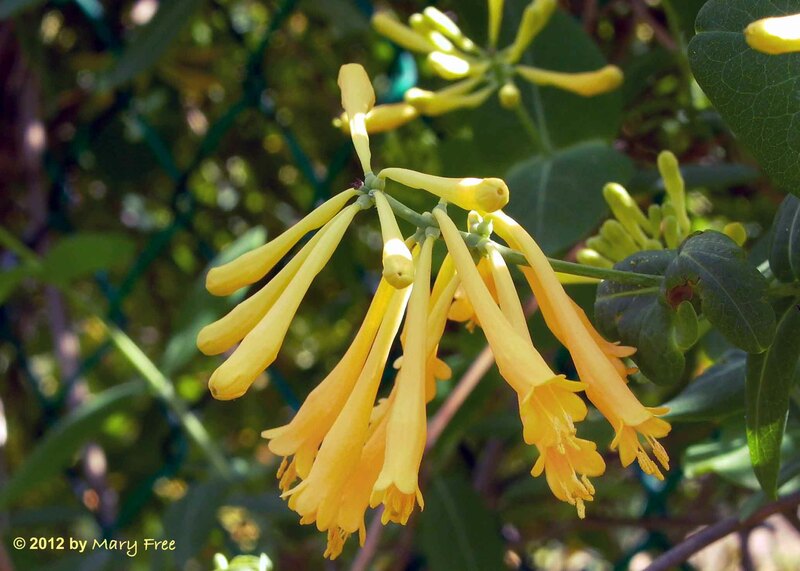 The Virginia Native Plant Society selected Trumpet Honeysuckle as Wildflower of the Year for 2014. This entry was posted in MG in the Garden, Tried and True Native Plant Selections for the Mid-Atlantic and tagged Lonicera sempervirens, Tried and True Native Plant Selections for the Mid-Atlantic, trumpet honeysuckle, vine. Bookmark the permalink.